CROCKETT, George William, Jr., a Representative from Michigan; born in Jacksonville, Duval County, Fla., August 10, 1909; attended the public schools; A.B., Morehouse College, Atlanta, Ga., 1931; J.D., University of Michigan Law School, Ann Arbor, 1934; admitted to the Florida bar in 1934 and commenced practice in Jacksonville; senior attorney, United States Department of Labor, 1939-1943; hearing officer, Federal Fair Employment Practices Commission, 1943; senior member of law firm, Detroit, 1946-1966; elected judge, recorder's court, Detroit, 1967-1979; acting corporation counsel, city of Detroit, 1980; elected simultaneously as a Democrat to the Ninety-sixth and to the Ninety-seventh Congress by special election to fill the vacancy caused by the resignation of United States Representative Charles C. Diggs, Jr., and reelected to the four succeeding Congresses (November 4, 1980-January 3, 1991); was not a candidate for renomination to the One Hundred Second Congress in 1990; died on September 7, 1997, in Washington, D.C.; interment in the New Zion United Methodist Cemetery in Laurel, Delaware. 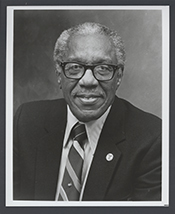 George William Crockett, Jr. in Black Americans in Congress, 1870-2007. Prepared under the direction of the Committee on House Administration by the Office of History & Preservation, U. S. House of Representatives. Washington: Government Printing Office, 2008.